Keeping birds away from our garden fruit ranks right up there with keeping bugs from eating all our hard-earned vegetables. 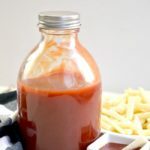 Last year I shared this organic insect garden spray that works really well on lots of things including basil, beans, cucumbers, and flowering plants like roses and trumpet vines. 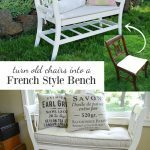 That has gone over really well with huge shares on social media and Hometalk and lots of people chiming in on the comments on how it worked for them. So I thought I’d share a much smaller victory I’ve recently had at keeping birds from eating every last one of our berries. 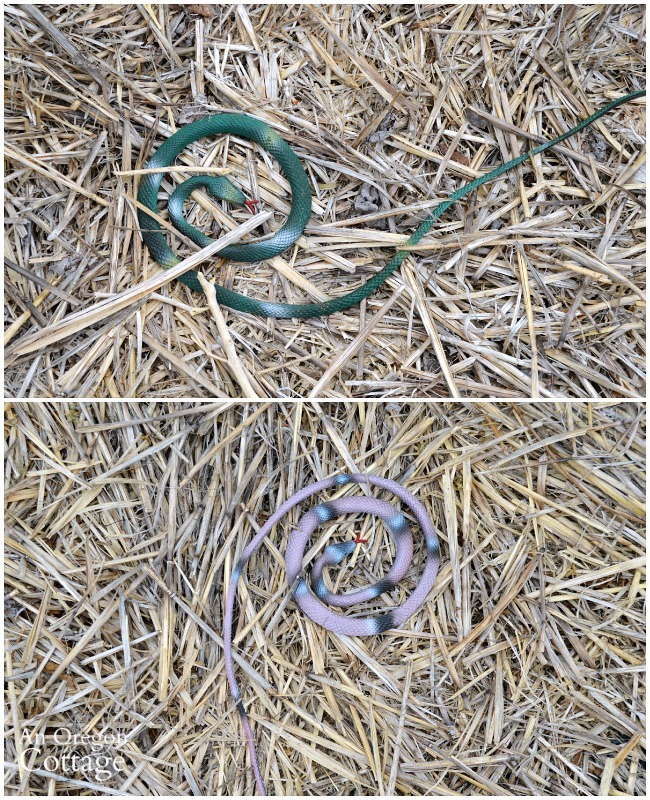 It’s super easy, inexpensive, and doesn’t require the netting that makes it hard to harvest and sometimes ensnares animals (readers have told me of not only birds being caught in the netting, but snakes and even a cat got tangled in one). 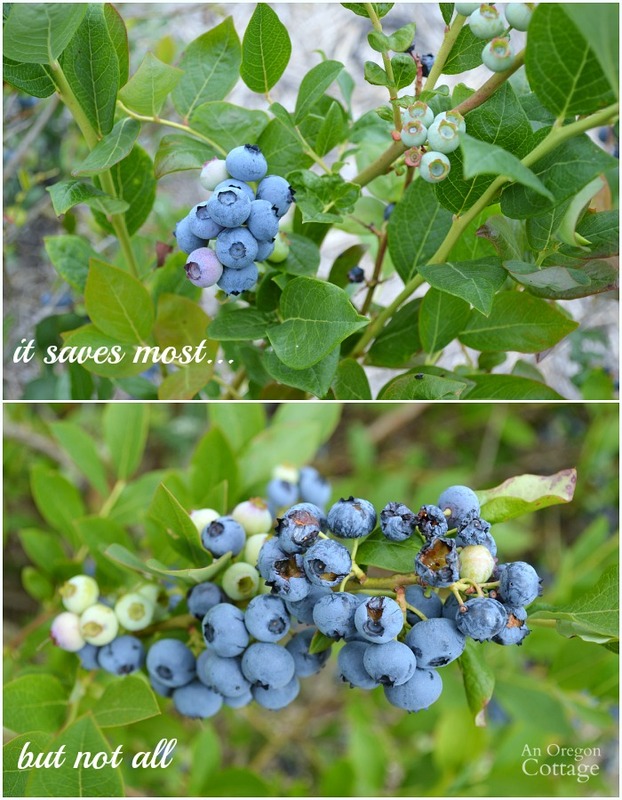 Our blueberries started ripening earlier than normal this year (along with everything else in our warmer-than-normal spring and summer) and by the time I noticed, the birds had already gotten most of the ripe berries, shown above. I took 10 minutes, ran in to the garden shed to get my bird scare weapons and set them up. I waited about 3-4 days before checking and this is what our bushes looked like – bird-damaged berries only here-and-there with LOTS of untouched berries for us to pick! So, what were my weapons in the war to protect our berries? Two things I picked up from the Dollar Store: toy snakes and shiny mylar pinwheels. Really! There’s a couple reasons why they work and a couple things you need to do to keep them effective, but at least for me, they really help to keep the bird damage to a minimum with the least amount of cost and effort on my part. Buy a number of different kinds and try to keep to colors that are more realistic, since the idea is to fool the birds. ONLY bring them out right when the berries are starting to ripen. Lay them out randomly, but make sure they can be seen. Move them around every few days. Put them away right when harvest is done. 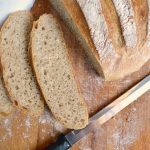 The most important part of this is to not let the birds get used to them, so you want to only use them during the month or so of harvest. The second most important thing is to move them around whenever you’re out picking – again so that the birds don’t get used to them not moving. I’ve used toy snakes for about 3 years now in the berries all by themselves and they work pretty well in the beginning, but the birds probably get used to them even with moving them around. It’s definitely worth it, I think, because it’s so easy. 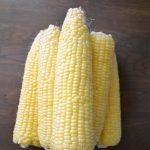 You do have to warn people who come to pick, though – I’ve had some fun reactions to them! 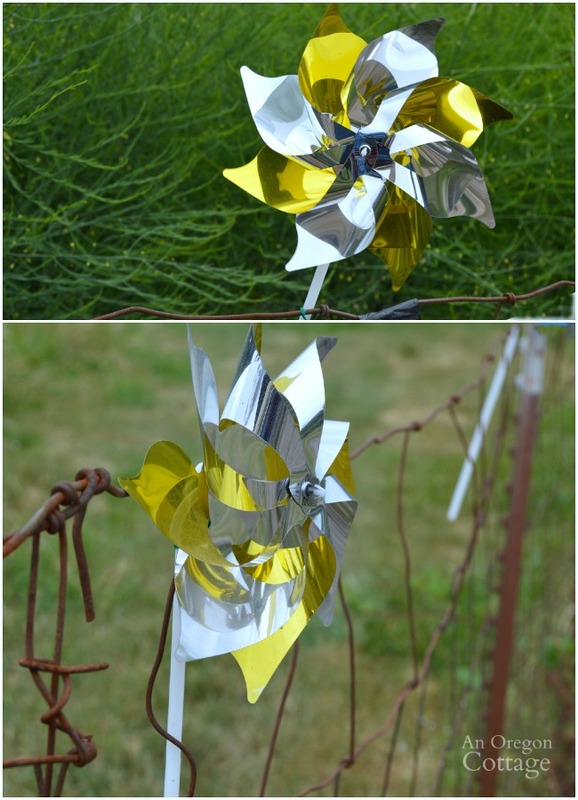 However, when I added the pinwheels last year, these two in tandem worked better than I had hoped and my experience was the same this year, which meant it worked well enough that I could share it with you! Buy the shiny mylar-type pinwheels. Like the snakes, ONLY bring them out right when the berries are starting to ripen. 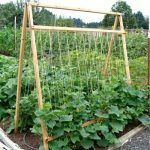 Attach them to stakes or fences that are near or among the rows (I use duct tape on our fence and some bamboo poles). They obviously work best if you have some wind – the noise when they start spinning really works to scare birds away (and sometimes people who aren’t expecting it! ), as well as the shiny movement. Again, put these away right when harvest is done. So you can guess that like the snakes, using them only when the berries are ripening is key. Even though they’re pretty don’t leave them out for longer, as birds are pretty smart I’ve found. Keep them surprised and don’t let this season’s babies get used to them! SO easy, right? And, I have to admit, kind of fun! However, I’m not going to lie and say that it will keep birds away from your berries completely, as you can see from the pictures above. To me, it looks like a bird started eating away and then was scared off by one of the pinwheels starting to spin. There are plenty of berries left for us, since we have quite a few bushes that produce for us (nine that ripen at different times over about 1-1/2 months)- in fact, I had to ask my sister to come and pick to help us keep up with them all! If you want to keep birds away totally, pretty much your only option is to build a structure and cover it with netting or screen. That’s just too labor intensive and expensive for our nine bushes that produce for just over a month. But grabbing some snakes and pinwheels for a couple dollars and taking a couple minutes to put them up (and then put away)? That’s right up our alley! 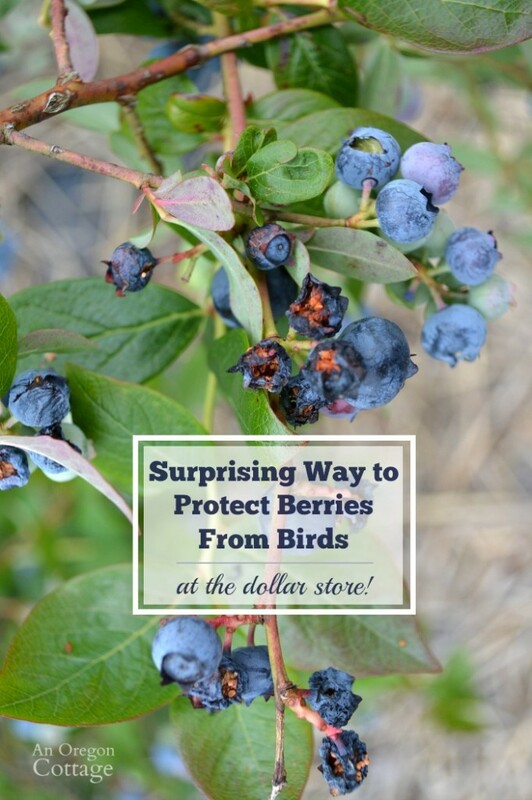 How do you keep birds from your berries? Have you tried either of these things? Share your successes (or failures) in the comments with us! My blueberry bushes are flowering and for the first year, there are A LOT! But, I’ve noticed birds all over the bushes. Do you know if they can ruin them before there are even berries? Any idea what they are doing?? Are they eating the flowers?? I’d be grateful for any help/insight! Thanks! I’ve never heard of them eating the flowers – maybe it’s the smell and they’re already waiting for the berries? Then you’d be better off covering them with netting since they’ve already found them! What a great idea. I’m going to try this next week; the birds are getting all my berries. How do I get rid of voles(moles) naturally? Oh, voles (field mice, not moles) are the bane of my vegetable garden, Gina! We had to line our raised beds with expensive metal cloth (I can’t remember the name, but we made a video about it) to stop them from eating our root crops. I haven’t found a way at all to get rid of them – natural or not. 🙁 We just try to make it inhospitable for them and trap what we can. Sorry! From what I’ve read, the chimes might not work. You should do a search for that idea. Thank you! What a great tip! I have cheap chimes that I stake right in with each blueberry bush. I will add snakes and windmills as well. I don’t think the windmills will work as we have about 2 acres. To mark new plants and hidden rocks for lawn mower guy I have windmills so the animals are already used to them. Chimes are a good idea, too, Sandra, but you’re right about them being used to the pinwheels. Have you tried this with deer? 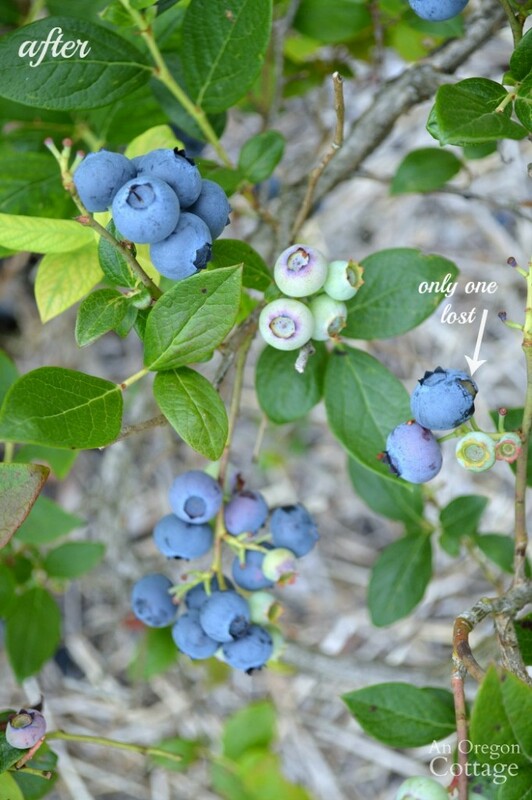 I have two blueberry plants on the back porch ( close, to discourage deer and birds) but it hasn’t worked! I looked the other day, and saw all these wonderful large berries, and next time I looked, the leaves AND berries were all gone! Not sure WHAT is eating them. I will try the pinwheels first. I hope it works. Of course, I’ll have to wait until next year, now! Jami, I’m not having any problems like this with birds. But, I have a plant nursery where I start my own cuttings and then pot up the rooted ones and so on. It’s the blasted squirrels! Really just one in particular….I have named him Blackbeard the Raider…he literally digs up almost everything….trees….hens & chicks….baby plants….BIG plants…he isn’t particular. Do you have any suggestions for that? Oh, and we have a family of rabbits that also enjoy some bean plants but I sprinkle crushed egg shells around those things and bunnies don’t like walking on egg shells! But then one of them devoured a Mouse Ears Miniature Hosta that was planted in the ground. Our mini doxies keep after them all, but they’re not outside all the time. I’ve tried Repels-All, and it works somewhat for the rabbits, but that squirrel is attracted to it, I think. So, any suggestions? Thanks! I’ll have to try this next year with my blackberries! The birds already got most of them this year.